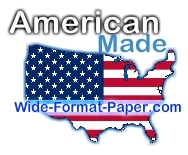 CAD Paper 24" x 150' American Made Product 20lb cad paper rolls wide format printing paper are CAD designed for HP, Canon, Epson, Oce all 2 inch core inkjet Media printer large format copier machines. The paper whiteness 92 Bright and allows for crisp, clear ink acceptance. Cad monochrome inkjet bonds are extensively tested for best performance and quality. You will see a consistency of superb image quality from roll to roll each time you order our paper. American Paper; each plotter paper roll is bagged in water proof thick plastic bags and thick boxes giving travel quality and security. Fresh from the mill. One may wish to also see our roll of 24x150 wide printing paper. 20lb Inkjet Bond 24 inch Paper less than .13 cents a foot with Wide-Format Saver at 150' Roll for HP, Oce, Canon, Epson, Kodak, Encad and USA running large-format inkjet printers using 2" Core. Fast / Smooth Printing Wide-Format. 730245U recommended..
Click the button below to add the CAD 24" X 150' Paper to your wish list.